YANGON - Myanmar’s civilian president Htin Kyaw resigned due to ill health on Wednesday and is expected to be replaced by a close ally of de-facto leader Aung San Suu Kyi, a move unlikely to affect power in a country where the army remains influential. Htin Kyaw’s office said he was retiring “in order to take rest from the current duties and responsibilities”. Win Myint, a Suu Kyi loyalist who has served as the speaker of the lower house, was likely to replace him, said NLD spokesman Aung Shin. Win Myint has had a tight grip on the parliament and his critics accuse him of stifling democratic debate, including from within the caucus of Suu Kyi’s ruling National League for Democracy (NLD) party. He resigned from that post on Wednesday. “He is loyal and has been a member of the NLD since the party was founded,” said Aung Shin, who lauded Win Myint’s performance as the lower house speaker and said he has “worked very well with Daw Aung San Suu Kyi during the whole period”. Suu Kyi is known for keeping her cards close to her chest and operating only with a very narrow group of trusted acolytes. Local media, citing confidential sources, have also reported Win Myint has been tipped to become the next president. Analysts said the move was forced by the 71-year-old Htin Kyaw’s deteriorating health, and was unrelated to the crisis sparked by the brutal military crackdown that has pushed out hundreds of thousands of Rohingya Muslims to neighboring Bangladesh. 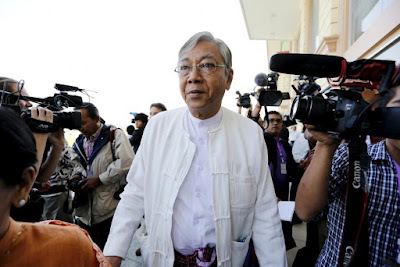 Speculation over Htin Kyaw’s ill health mounted in recent months over his rapid and visible loss of weight. According to the country’s constitution, the more senior of two vice presidents will stand in as president until a new leader is elected by parliament within seven working days. “There’s no doubt as to what the outcome of this will be,” said Richard Horsey, a former United Nations official and Yangon-based analyst. “The NLD has a strong bloc and a supermajority so whoever is selected as the lower-house candidate will become the next president,” Horsey said. In the meantime, Myint Swe, who was the military’s appointment for vice-president, will stand in as the acting president. The president is the head of state and government in Myanmar, and under the constitution has far-reaching powers. However, Htin Kyaw’s role was more ceremonial because Suu Kyi has been Myanmar’s de facto leader since April 2016. A constitution drafted by the former junta bars Nobel Peace Prize laureate Suu Kyi from the top office and so she hand-picked Htin Kyaw, a close ally of hers, to become president following a historic landslide victory in 2015. The charter also reserves for the army one quarter of the seats in parliament and several major cabinet posts, including defense, interior and border affairs, giving it an effective veto over constitutional change and control of security affairs. Yangon-based diplomats say the relationship between Suu Kyi and the military chief, Min Aung Hlaing, is marked by mistrust and lack of frequent, open communication, highlighting a risk even in the smallest changes to the leadership structure. Myint Swe is a retired general who headed the feared military intelligence agency under former junta leader Than Shwe. When Than Shwe ordered a crackdown on anti-junta protests led by Buddhist monks in 2007, known as the Saffron Revolution, Myint Swe was the head of special operations in Yangon.